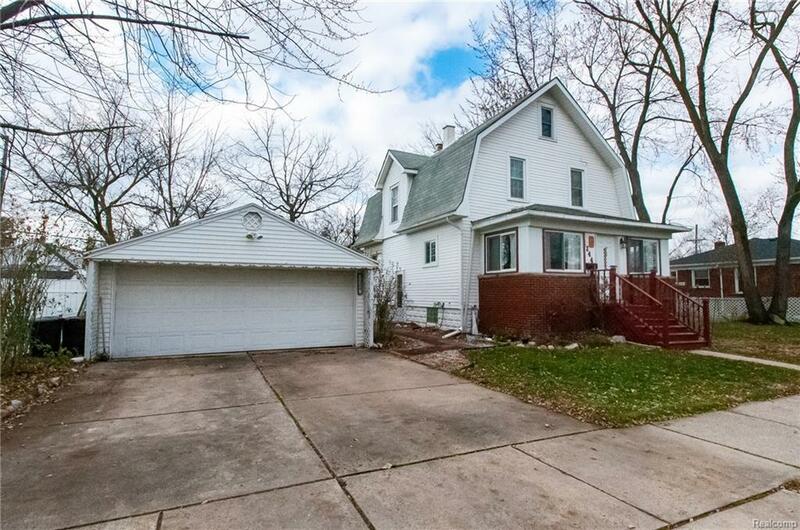 Welcome to this well maintained 3 story, 4 Bedroom, 2 and a half bath Dutch style Colonial! The entry level of this home features original hardwood floors throughout with an enclosed porch, updated kitchen with stainless steel appliances, center island & plenty of cabinetry for storage, a large formal dining room great for entertaining family & friends, spacious living room, mud room and updated full bath. The 2nd level of this home contains 3 bedrooms with an additional full bath. Also on 2nd level is a balcony overlooking the fenced back yard, perfect for enjoying morning coffee or relaxing on starry nights. 3rd floor features a large bonus room, currently used as a bedroom, but could easily be converted into an additional living area, rec room, office, etc. Detached 2 car garage. HVAC less than 2 years old. Close to freeways for easy commute & only minutes away from downtown Wyandotte and waterfront for shopping, dining & entertainment. Call today to schedule your private showing!